In this second part of a short series discussing modern fly lines, we will discuss lines that are applicable to Spruce Creek and other club waters. The amount of variety in the fly line market can be staggering and confusing. This is probably most true when trying to select a line for simple trout fishing applications. When shopping for a new line the consumer is faced with so many choices, and these choices are made even more confusing by the labels put on these lines. Just for kicks, this morning I perused the website of a leading line manufacturer, and found that they produce 36 different lines, just in the 5 weight class. It’s gotten a bit ridiculous in my opinion, and it is no wonder why we are so often asked about line weights and types of lines needed for everyday trout fishing applications. Below is a list of 3 lines that are applicable for trout fishing situations here at the club. For simplicity sake we will assume we are looking at lines in the 5 weight class and will forego describing in detail the different reasons for each line. All are Orvis and can be purchased or ordered through the club fly shop. Orvis Hydros DT Trout – The DT stands for double taper; this is a great line for trout fishing. Although double tapers have gone out of “style” in recent years this taper is probably the best all-around taper for trout fishing. I have this line and paired with the Orvis Recon 5 weight it is a great set-up. Keep in mind the double taper is also the best bang for the buck because once one end is worn, it can be switched and fished again. Orvis Hydros WF Trout – This is Orvis’ standard weight forward line. Weight forward or a “denser front end” line has become the staple in today’s trout fishing world. This is a smooth casting line and pairs well with faster action rods like the H2 and H3, along with many Sage rods. The one thing to keep in mind about weight forward lines is to stay away from the lines labeled HD, MX, or some other lettering that indicates an even heavier front taper. Lines labeled with these descriptions are not for normal stream fishing situations. Orvis Hydros V Sink Tip – Although not necessary, a sinking line can come in handy when fishing streamers and is included in this list for variety sake. A sink tip would be completely unnecessary on Spruce and other smaller streams, but could be very advantageous on the Little J when fishing streamers. This is Orvis’ basic sink- tip fly line and is made easier to understand by staying labeled by the usual line weight system and not in grain weights as many sinking lines are labeled. The most important thing to remember is that simplicity often rules the day when it comes to trout fishing fly lines. Maybe the most overlooked aspect is not so much which line but making sure your line is not cracked, old and worn. If it is, these 3 lines above will get you back in the game. Andy started fishing the Juniata River with his father at a very young age. Since then fishing has been a major part of his life. 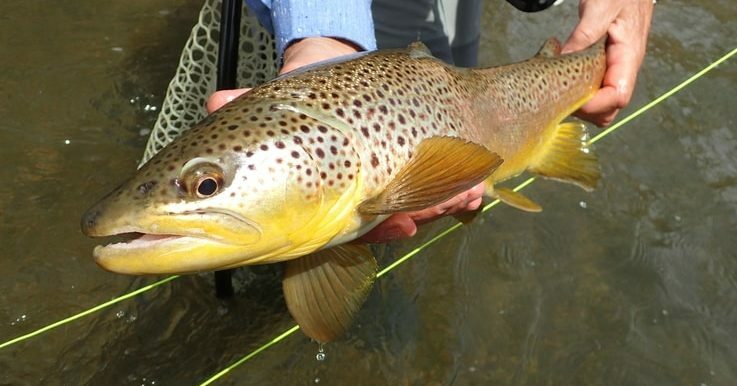 As a teenager he became obsessed with the brown trout of Penns Creek and the smallmouth bass of the Juniata River. After guiding in some form or another for 14 seasons he started working for HomeWaters in 2017. He lives in Juniata County Pennsylvania with his wife Emily and young son Drew. Andy has been a great addition to HomeWaters guide staff and will be sharing tidbits of his knowledge through blog posts over the coming years.